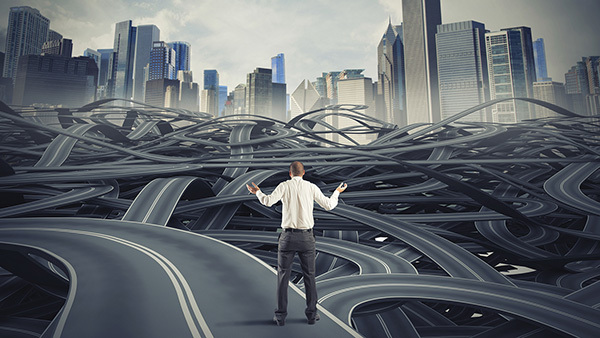 When confusion and misunderstandings prevent employees from working efficiently, firm owners need to provide direction. Make your goals clear to employees to keep them on track. These days, people often use the phrase “staying in your own lane” to mean minding your own business: don’t tell me what to do, how to live my life, or how to raise my child. In our personal lives, most of us have pretty clear boundaries (either stated or implied) with our friends and our spouses or significant others. Friends usually know not to push too hard about things like our relationships, our religion or our politics, and married couples do much better when they stay out of their spouse’s face about their jobs or what they do to relax (sports, shopping, gardening, etc.). The idea in these relationships is to work as a team, to benefit each other, rather than further complicate each other’s lives. In our work with advisory firms, we use this idea of “staying in your own lane” to help owner-advisors and firm employees better understand one of the biggest roadblocks to the success of advisory businesses: confusion and misunderstandings about who should be doing each of the key tasks in a firm. This failing to get everyone on the same page leads to important tasks not getting done, wasted time when efforts overlap and friction between employees, and between employees and firm owners. As you might imagine, this almost always leads to firms underperforming their true potential. The solution is to enable everyone in a firm—employees and owners alike—to focus on his or her job, secure in the knowledge that someone else is competently handling all the other responsibilities that need to be done. Getting there is harder than you might think. No matter what they call it, to build a successful firm, it’s essential that owners understand why they started their firm (or if they are a successor owner, why they bought the firm). For most independent advisors, the reason is some combination of control—over their working environment, their career, their success and how they care for their clients—and the potential for a certain level of financial success. If firm owners can be specific about what they want in each of these areas, they’ll have a much greater chance of realizing their dream. Do your employees buy into your dream/? Many firm owners have a hard time understanding why this is important: After all, their employees “just need to do what they tell them.” If your dream is to spend every working day with a bunch of drones just going through the motions to get a paycheck, then you can stop reading now: You’re undoubtedly already living the dream. But if your dream involves more than taking care of a few dozen or so clients with a bit of clerical help, then you’re going to have to get your employees on board. Most owner-advisors don’t realize that working in an independent advisory firm can be a dream job for their employees, too, and not just junior advisors who see themselves as owners someday. Working in a successful small business can have many perks, both professional and personal: being with a group of people you like, having a direct impact on the success of the business, helping clients in tangible ways, watching your career grow with the business, learning new things and taking on new challenges. These are but a few of the reasons many people love working in advisory firms. So in many cases, most advisory employees already share some of the firm owner’s dreams. By sharing exactly where you want your business to grow, most of your employees will wear themselves out helping you get there because it’s their dream, too. And if they don’t buy in, they’d probably be happier working somewhere else. What needs to be done to reach that dream? Now we’re getting down to the nuts and bolts. What changes do you need to make to your business today to reach your dream tomorrow? Are you targeting the right clients? Is the quality of your client service high enough? Do you need new or different client services? Where will new clients come from? Are your operations efficient enough to handle your target number of clients? What employee skills will you need to help you build this dream? This is the step where you take a hard look at where your firm is now and create a blueprint for what your dream firm will look like. What are everyone’s strengths? Once you know where you’re going with your business, it’s time to assess your team and how they can help you build that firm. That means assessing everyone’s skills, knowledge and experience so you can match them to what needs to be done in your dream firm. Most current employees will fit; some won’t. Is there any training, education or experience you can give them? Ask yourself: What’s missing? What are the holes you’ll have to fill to get where you want your firm to go? What are you willing to sacrifice for that dream? In an ideal world, we’d all spend our days doing something we love to do, but sometimes things don’t work out that way. Sometimes employees and owners have to do some things that aren’t their favorite tasks. Often this occurs when the business isn’t quite big enough to hire a full-time person to take over a particular responsibility—say, back office or client communication or report generation. Somebody has to step up and get the job done, even it’s not their career goal. This is an area where “buying in to the dream” can go a long way. Motivated employees will usually do what needs to be done, particularly if you can promise them it won’t be forever (but you better mean it—unfulfilled promises are sure-fire motivation killers). Conversely, when employees won’t step up, it’s a pretty good indication of a lack of buy-in. What lane should everyone be in? It’s important to note here that we’re talking about people’s responsibilities, not their titles. People often get caught up in titles or labels, so we find it’s better to focus on what everyone is responsible for doing. Of course, the goal is to match everyone’s strengths with their responsibilities. We try to put everyone in the firm—employees and owners—into positions where they have complete freedom to work within those strengths. That way, we’ve eliminated the two main reasons people tend to stray out of their lanes: They are better at something other than what they are doing, or they feel their ability to maximize their contribution to their firm’s success is limited. By giving everyone in a firm the right responsibilities, we find that folks rarely stray out of their own lanes. It is the foundation for a great advisory firm, and it rests on the idea that working in an advisory business can be a dream job for everyone in the firm. In my next column, I’ll talk about how to build the infrastructure to support this foundation: increasing everyone’s production and boosting the success of their firm.